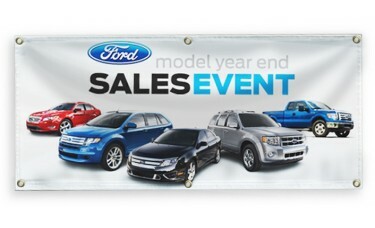 Our custom printed vinyl banners are digitally printed on one side with vibrant inks on premium heavyweight 13 oz. scrim vinyl banner. This material has a smooth surface for optimal print quality. Add your company name, logo, or slogan to draw attention to your business, special promotion, event, team or school. Vinyl is a very flexible and portable material, which enables it to be used in a wide variety of applications. Finished with hemmed edges and grommets every 2ft on all 4 sides. Production time is 2-3 business days + shipping time after proof approval.